Two “engines” and two connections. 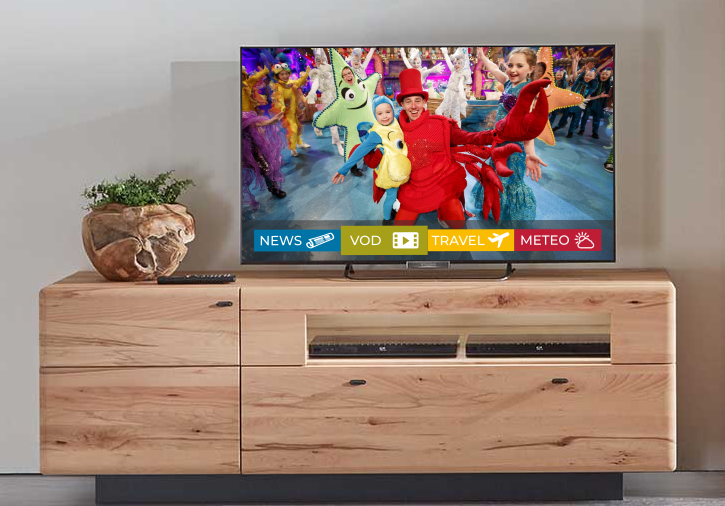 The viewer chooses and the TV automatically takes care of choosing the necessary resources and connection. All the contents that are received by coaxial cable. DTT, satellite or cable television antenna. All content and web / internet tools. HTML pages, video players, scripts, etc. 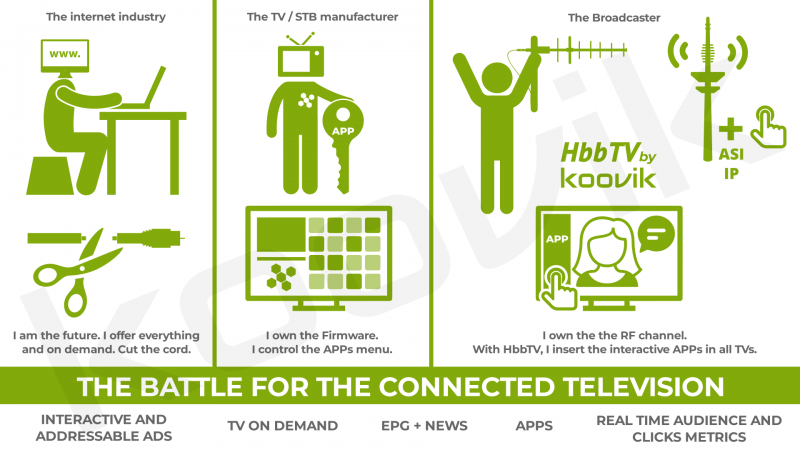 What is the HbbTV ? Hybrid Broadcast Broadband TV or HbbTV, is a STANDARD and a pan-European hybrid television initiative launched in 2009 by the consortium of the European Broadcasting Union (EBU) with the aim of combining television broadcasts with broadband services, with the objective of offering the viewer new interactive features. Version 2.0 of the HbbTV specification was approved by ETSI as ETSI TS 102 796 V1.3.1, in November 2015. The HbbTV is currently available in 36 countries and 44 million devices. The HbbTV standard has been adopted by the major TV manufacturers (Samsung, Philips, LG, Sony, Panasonic, Toshiba, Loewe, Hisense, Vestel, Sharp, etc.) that offer it in most of their models. Connected TV is a reality. The user wants interactive services. There is no debate possible. The internet giants tell us: Forget about the antenna signal, disconnect the coaxial cable, this is the past. We offer you everything online, and interactively so you can see it whenever you want. We have prepared some gadgets (Chromecast, appleTV, etc.) so that you can see it on your TV. 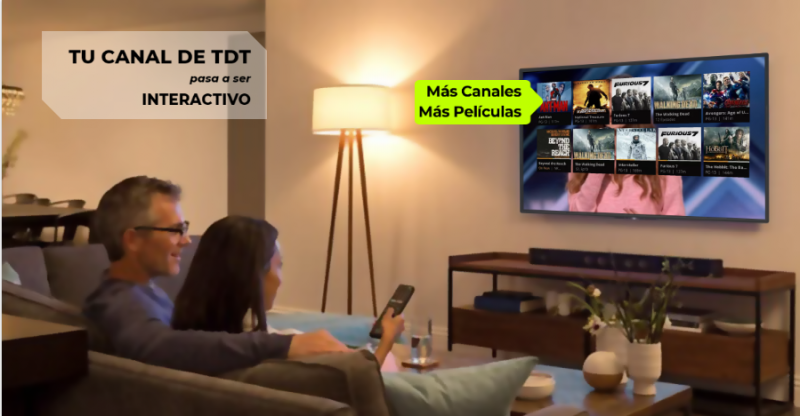 The TV manufacturers and Google through Android TV direct the user with the management of the Apps that appear by default in Smart TV’s. The goal is to move the Internet advertising model to the TV screen. 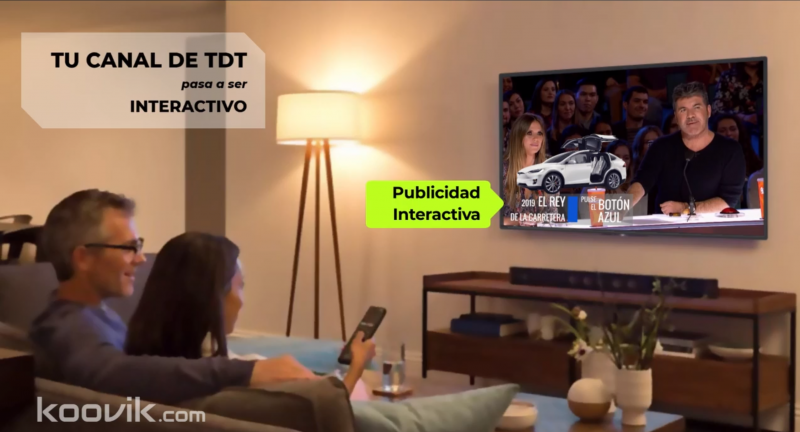 HBTV is the “super-power” Broadcasters have to INSERT Interactive Apps on all TVs. It allows offering interactive and personalized advertising, pop-ups, Video on Demand, EPG, News, Audience Metrics in real time, etc. ¿Impressive? yes, you are right. Internet giants and TV manufacturers have realized the power of the “animal”, and have stopped it in the US. 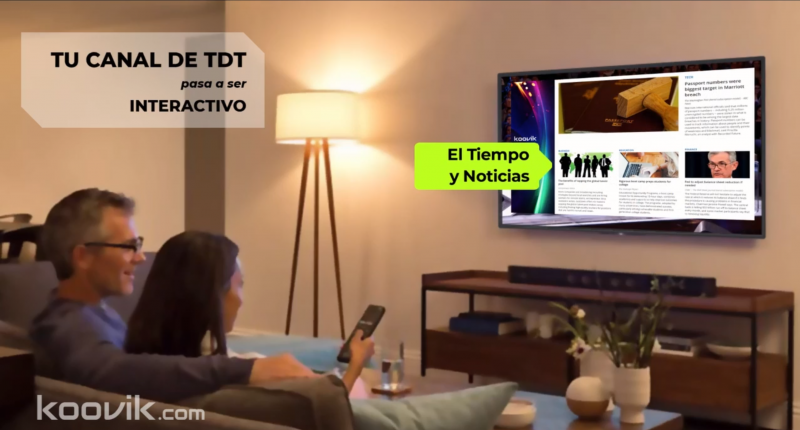 HbbTV has disappeared from CES2019, after being announced to hype and cymbal in CES2018. #HbbTV is not a red or blue button to be ‘a la mode’. It is the difference between staying behind and push the turbo button to lead the competition. 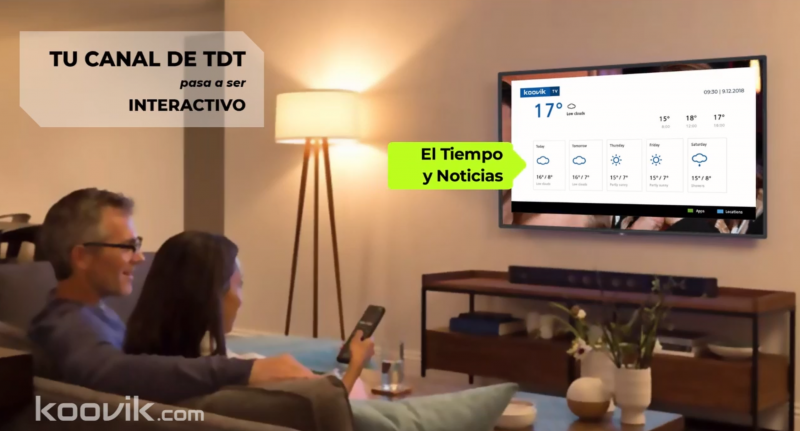 How does HbbTV work for the viewer? When the viewer tunes to a channel, after a few seconds, a pop-up “Red Button” appears that allows the viewer to “click” using the button of that color on the remote control. 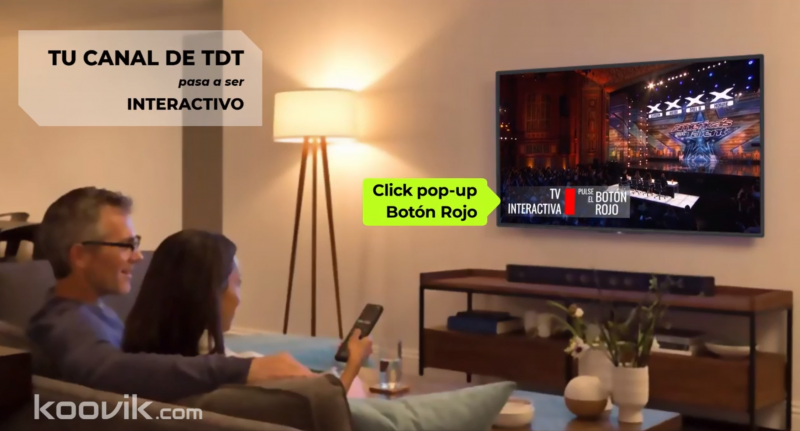 In fact, the broadcaster has added a direct link, which allows the viewer to access all the interactive content that the TV channel or broadcaster offers to its viewers. 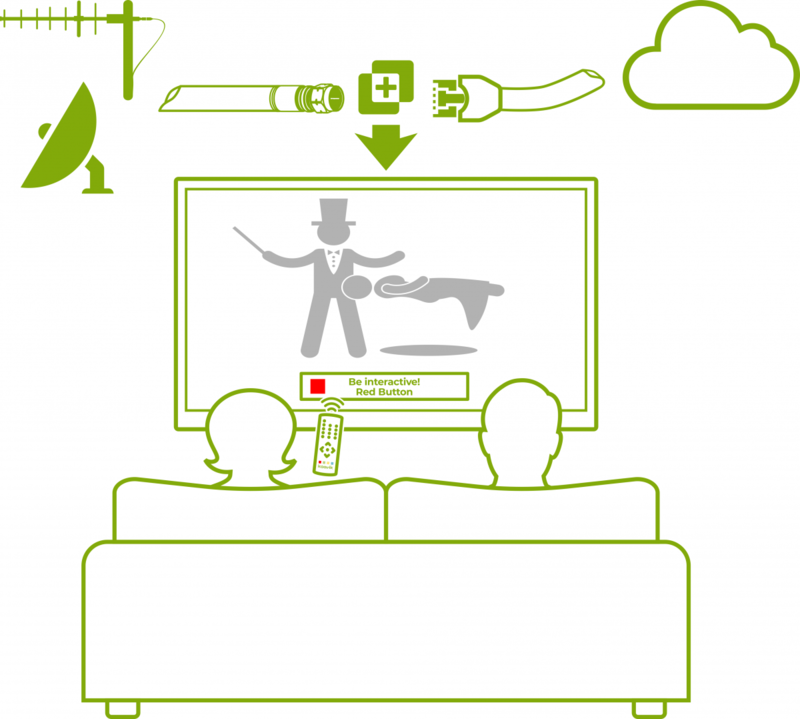 How does HbbTV works for the broadcaster? Inject the red button pop-up/link on the transport stream (program) transmitted by the DVB-T broadcast. This link can include the “pop-up” but also invisible scripts for audience measurement, etc. Upload the content and services he wants to offer to the cloud. 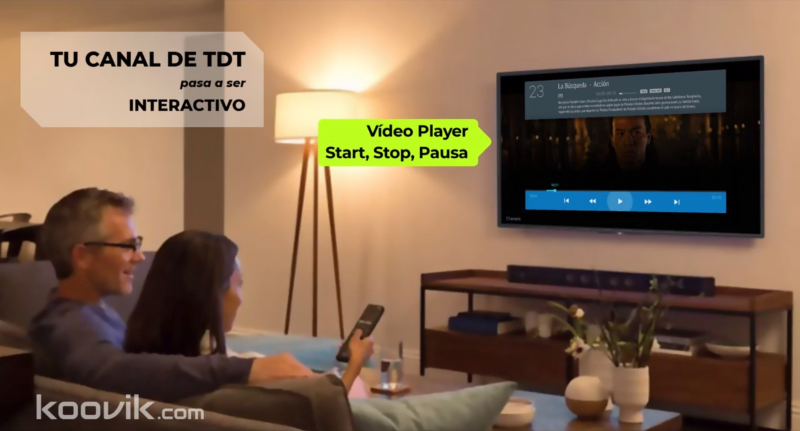 The HbbTV playout generates a TS that is multiplexed via ASI or IP with the rest of the video, audio, and/or EPG Multiplex services. 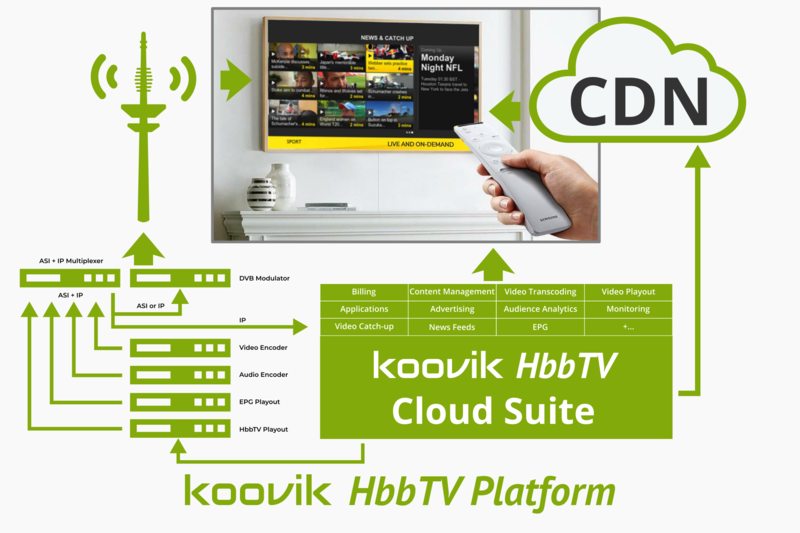 The koovik cloud suite offers multiple services. By clicking on the button on the remote control, the viewer enters the Portal with access to the whole online menu. The portal is customizable with the corporate logo, colors, and the channel contents. Live content ingests and automatic recording. 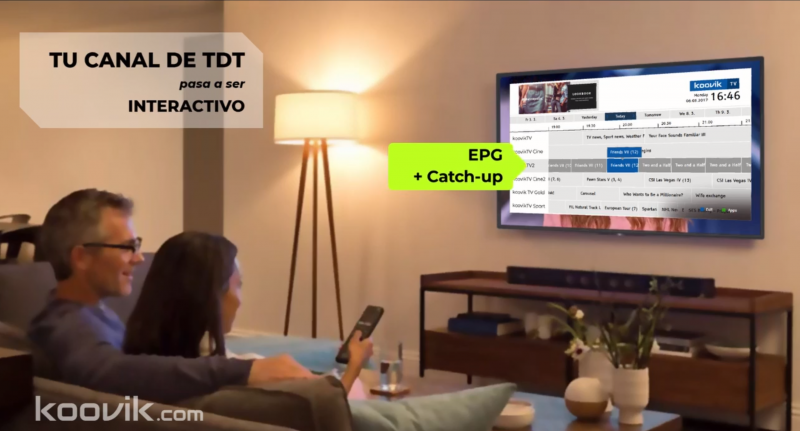 Combined with the EPG, it generates the content available on demand. News and HTML content in general. 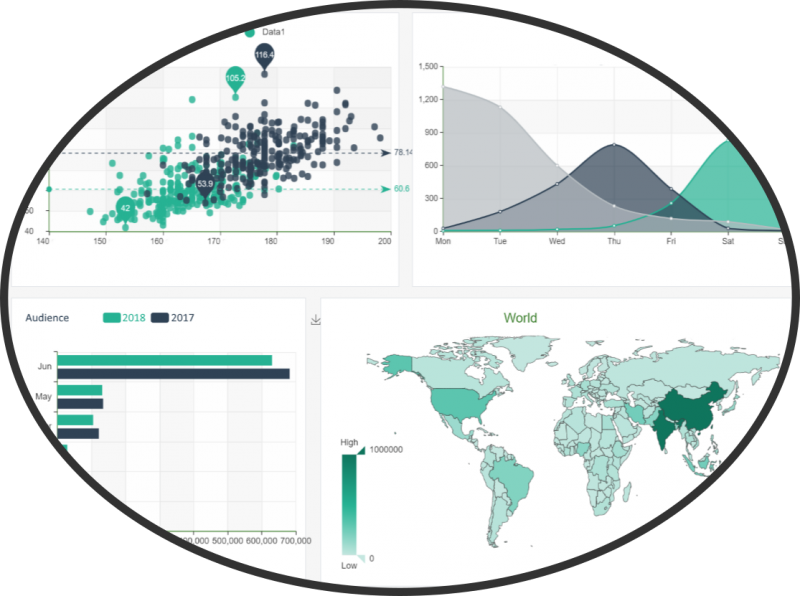 Real-time insights about your audience.